Today is the first post of a brand new feature here at Once Upon a Bookcase - A Novel Cover Up. A Novel Cover Up is a semi-regular feature that looks at how covers are made. 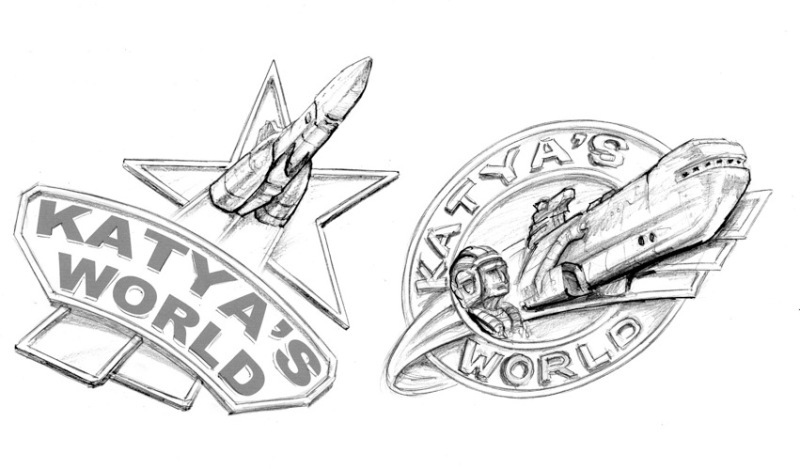 Thanks to Strange Chemistry, I have been fortunate enough to interview book jacket illustrator Lee Gibbons about how he designed the cover for Katya's World by Jonathan L. Howard. Other than the cover, all images in this post are copyrighted to Lee Gibbons and used with permission, and can be clicked to enlarge. Can you tell us about the cover for Katya’s World? What do you hope it tells readers about the story? 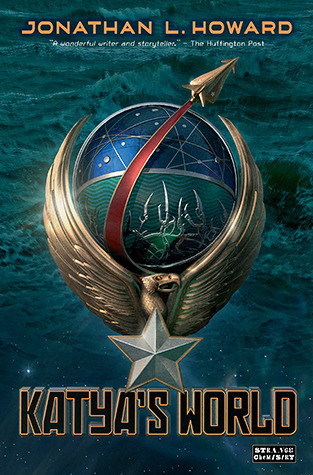 With a cover like Katya's World, the cover image needed to be a logo rather than an illustration of an image taken from the text. What I tried to get across was something of the atmosphere of the story and the world in which it takes place, without giving away any specific plot points. Something that was very important was to stress that even though most of the action takes place beneath the sea in submarines, this is an ocean on an alien planet light years from earth. The publishers already knew the elements they wanted for the cover when they commissioned me for the job; A retro-look Russian badge that would incorporate the title lettering against a sea and stars background. From there it was up to me to come up with a design for the illustration that would work as a book cover. 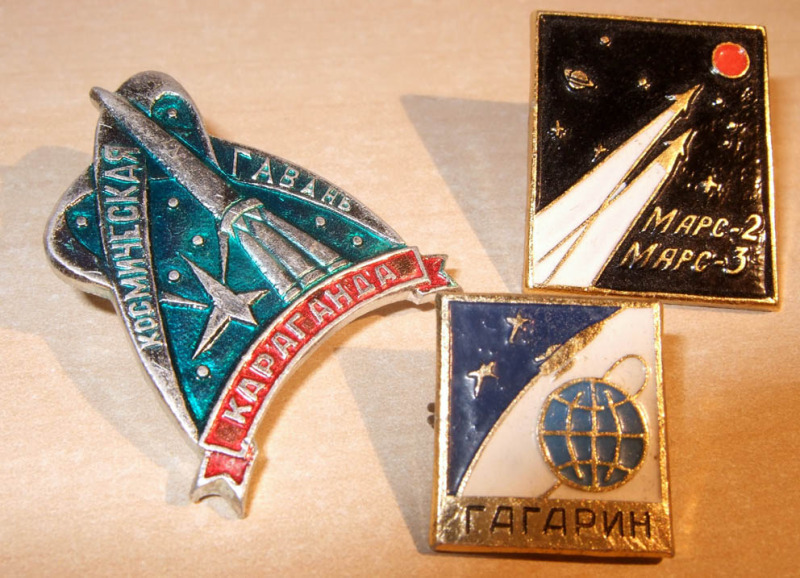 From the start I was asked to use Soviet space mission badges from the 1960's as a style guide. This suited me fine as I have a fascination for these and have looked to them for design inspiration on previous work. I was sent the manuscript, and after a read through was able get a good feel of the world the characters inhabit. This really helps when the time comes to get some ideas down on paper (It's becoming increasingly rare in my job to be able to get a look at the full story before coming up with a cover). What went into creating the Katya’s World cover? Can you tell us about the process? Who else was involved? All my illustrations are now created on the computer, using CGI, photography and digital painting, before being finished off in Photoshop, though I still do all my initial designs and layouts with pen and paper. These are ok to show to the publisher to see if I am going in the right direction. If they are, I scan in the drawing and quickly colour it up on the computer. This gives the client a clearer idea of what to expect for the final cover. When everyone is happy, usually after a few amendments, I can start the final illustration. In the case of Katya's World, everything (except the sea image in the background) was built in a 3D program or created in Photoshop. Usually with a cover, the objects I create only have to be seen from one angle, as, obviously, a cover is a 2D image. This time however, I also wanted to use the badge model for a video animation to promote the book. This meant a lot more care had to be taken so that things looked right from a number of different angles when I moved the virtual 3D camera around the scene. Lee created the whole trailer for Strange Chemistry. When the illustrations were finished, I sent a copy to get final approval from the Strange Chemistry team and, of course, the author. There are often a few (hopefully) minor revisions that will need fixing before the cover is finally sent off to print. As I mentioned earlier, we were always going to feature a metal badge on the cover, and these are the the first ideas I sketched out. The main problem I was having was trying to make the title lettering big enough to be easily readable while still fitting within the outline of the badge. Another worry was that these designs were too simple and could look a bit young for the book's target audience. This sequence shows my first scribble (this is me blocking out an idea to see if I think it could work). Next is the black and white visual that I sent to the client. I add some colour and when this is approved I can start on the final artwork. The last image is nearly there but not quite! A look at the final cover shows a white rather than a red star. Thank you, Lee, for such a great, detailed interview! Isn't it awesome to see all those early stages? Such brilliant art work! And woah at that trailer! So cool! Lee Gibbons is a British artist specialising in book jacket illustration for children and adults. He also produces advertising illustration, historical reconstructions, medical illustrations and film and tv concept designs. Best known for his SF, fantasy and horror work, he moved from traditional painting to digital imaging in the late 90's. In 2002 he formed the company Tin Moon Limited. Be sure to visit Lee's website, and check out Katya's World by Jonathan L. Howard when it's released on 8th November 2012. How cool! I love cover art and seeing the process behind Katya's World was a big treat. Thank you for such an interesting interview. I'm so glad you enjoyed it! :) It is gorgeous cover art! It's fascinating to see how what goes into make a cover like this, it's awesome! Oh wow this feature is fantastic!! It's so interest to see how the covers come together! This was really interest, thanks for posting it! I love seeing the amount of research and detail that goes in to books covers.